The Days of Johann, an agility dog! 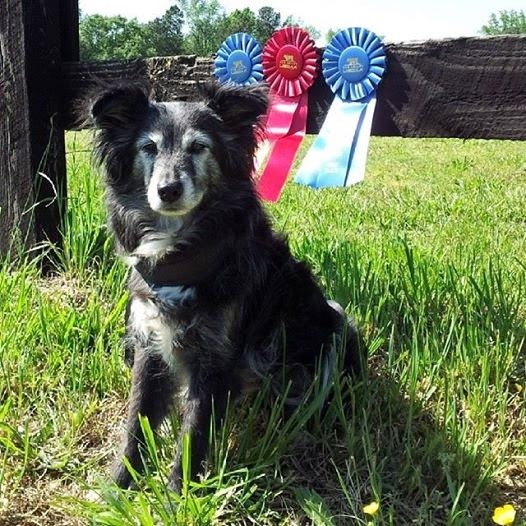 : My second agility trial in PIII USDAA! My second agility trial in PIII USDAA! 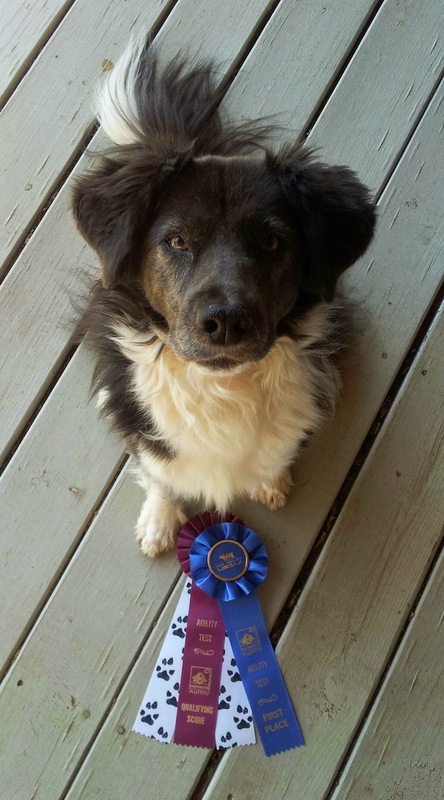 Just a few weeks after my first agility trial at PIII, it was time for my second one. This one was held near Canton, just about an hour from us. Friday was Masters only, Saturday Masters and then Advanced/Starters and Sunday Advanced/Starters only. Friday was a very short day and Mum entered me in Jumpers and Snooker. Saturday we were entered in Gamblers, Snooker and Standard. Gracie was entered on Saturday in Gamblers. The day started with Jumpers. After the last trial, Mum tried to be more sure of where she was going to be, where she would do a front or blind cross, etc., so that my lines would be nice and she would be out of my way (as that was a problem last trial). There were some nice turns, some nice straight-a-ways (which I love). We had a nice run and I ended up with a Q and 1st place. Our next run was Snooker. I remember this one well, as the oddest thing happened. We did three sevens (seven was a two jump and tunnel combo). But for some reason one of our reds wasn't counted and we ended up with 37 points. No other dogs in the small group qualified, so we got another SQ. What the DOG?! Ok, this is getting a little too ironic at this point (as I got a SQ on my first PIII Snooker run a few weeks ago, after struggling for years to get those 2 SQ's in championship). We headed home and did a few things around the cabin and got to bed early as Saturday was going to be a very long day. We got there very early and my first run was Snooker again. This one was going to be long, so Mum thought it would be a good op to test out our timing. 6 was a tunnel jump combo, 5 was a tunnel jump combo, 7 a teeter and the other numbers were jumps. We planned four reds with a 6, a 7 and 2 5's, starting with the jump in the lower left, which would give us 54 points if we made it all the way through. I wasn't running as fast as the previous runs and two of the jumps ended up being figure 8's (like you do sometimes at practice jumps? ), so the entire run took more time than we thought. I made it through the final six, but didn't get the last seven (a teeter) for 47 points. And I was just about to put my foot on that dang teeter too. Oh well, it was fun and good enough for a SQ and 1st place. OMD! Do you know what that means? I already in two trials and four Snooker runs have my 3 SQ's for my PDCH (if we decide I want to go for that title). Now we really talking situational irony, wouldn't you say? The next run was Gamblers, and we were looking forward to it. I love gambles, they allow me to be independent! The gamble was a parallel jump on the line, coming back in a bit to the left to the tunnel entrance, which headed out to the frame and then a jump beyond. Mum knew I had a good chance at this as I love my frame, I do, I do! We gathered up points on the dogwalk twice, got in a teeter and the tire, some other jumps and then headed into the gamble, and bam I got it! How fun was that! Another Q and a 2nd place with 44 points. Next up was Standard. Nothing extra difficult and we ended up with another 1st and Q. You know what that means? Yes, I went 5 for 5 with 4 1st places and 1 second place. Wow! That hasn't happened since I was a youngster. What fun! Gracie did very well too! Mum didn't enter her in anything except Gamblers this weekend, as she got a little freaked out at the last trial in Standard with that doggone teeter. So Mum decided to make Gracie's Gamblers run uber fun and it was. It was so fun to see Gracie run with abandon, fun, fast and furious, and still gather her self up and get the gamble for a second place and a Q. What a good Girlie! Team YoYo and Gracie went 6 for 6! Sadly our next trial and only trial the rest of the year is last of August/first of September. Mum has been thinking about doing a little AKC with us again, just to keep a little more fine tuned since there are fewer USDAA trial near us this year.